We are excited to announce that Istueta Roofing attended this year’s Metalcon International Expo. Metalcon is known for being the best place for metal workers to get the latest information and innovation on the metal industry. With over 800 booths from the industry’s leading suppliers, Metalcon is not only a place to see some of the best suppliers to the metal industry but also take part in some amazing educational opportunities to further enrich our craft. Several seminars and educational discussions will be taking place at this year’s expo and we are certainly excited to attend Resilient Buildings – Helping Prevent Damage from Natural Disasters and Understanding Metal Roofing: Parts I & II . 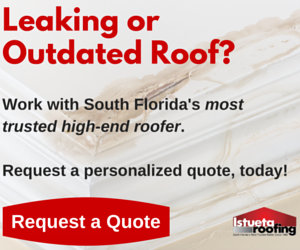 As a Miami roofing company, Istueta Roofing is always looking for ways to grow and become more innovative. With some of the leading experts in this industry such as, RHEINZINK America, Inc., (which we recently did a project with) , we are excited about the fantastic opportunity we had to see some of the best metal products in the world. One of the things that I really admire about the people behind Metalcon is that they award seminar scholarships to students, non-profit organizations, and government agencies to attend the expo. This allows those who may not be able to afford to come to the expo the opportunity to still attend the amazing seminars. With the ever changing developments of new products and technology that make metal construction one of the fastest growing industries in today’s residential and commercial developments, it is important for those of us in the industry to stay aware of the changes and developments in this area. Istueta Roofing strives to be the best providers of roofing solutions to all its clients and the Metalcon Expo gave us some wonderful new knowledge so that we may pass that innovation on to our clients and give them the best possible solution to their roofing needs.